Dorje Shugden Incense Sticks are handmade from rare medicinal herbs, oils, resins and spices in accordance with the instructions of H.H. Pabongka Rinpoche. Especially suitable as an offering to the Dharma Protector Dorje Shugden and to invoke his blessings, protection and presence during prayer. Dorje Shugden Incense Sticks have been carefully hand-made to meet the highest standards of quality. Formulated from rare medicinal herbs, oils, resins and spices in accordance with the instructions of H.H. 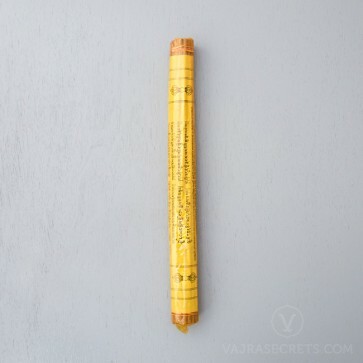 Pabongka Rinpoche, one of the greatest lineage lamas of the 20th century, this incense is suitable for cleansing and purifying the environment of unwanted energies, for meditation and relaxation, and for ritual offerings to the Buddhas. Prepared under the supervision of the eminent healing lama, H.E. Gangchen Rinpoche, Dorje Shugden Incense Sticks release a rich, woody and herbal aroma when burnt. Highly recommended as an offering to the Dharma Protector Dorje Shugden and to invoke his powerful blessings, protection and presence during prayer.